Looking for the best Nikon D850 deals? We've got you covered. This camera has fast become a full-frame DSLR that everyone seems to have added to their wish list – and the great news is that with lots of cheap camera deals around, right now is a great time of year to grab a discount on it. Here, we run through the key things you need to know – and you'll find today's very best Nikon D850 prices below, too. Our team is busy tracking all the best discounts from the world's top retailers, so you can be sure you're seeing the lowest prices available anywhere, in this article. Want to learn a little more about the camera? You can read our full Nikon D850 review right here. At its heart lies a 45.7MP full-frame (FX-format) sensor, which is one of the most impressive we've seen on a DSLR to date. Ordinarily, a camera with such a high-resolution sensor would be a slouch when it comes to burst shooting – but the D850 is different. Not only is its standard continuous shooting rate of 7fps very respectable, but you can boost this to 9fps with the optional battery grip. The sensor is also back-illuminated in design, which means it stands to gather light more efficiently to produce images with less noise than would otherwise be the case. Throw in the same 153-point AF system as the flagship D5, a 3.2in touch-sensitive screen, a battery that can last for 1,840 shots and a viewfinder with the highest magnification on any Nikon DSLR, and it's clear that the company hasn't skimped elsewhere on the spec sheet to deliver its headline features. But it's not just about what's on the inside that makes such a desirable piece of kit. You also get a weather-resistant shell that makes use of magnesium alloy, together with a generously sized, illuminated top-plate LCD and rear controls that light up. So, whether you're shooting in the day or in pitch darkness, you can still see everything you're doing. Videographers are also likely to be pleased by the fact that you can record 4K UHD video and capture images destined for 8K time-lapse footage, together with microphone and headphone ports and a clean HDMI output. 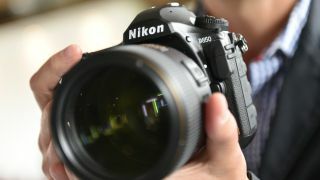 As a further bonus, the camera is compatible with many years' worth of lenses, both from Nikon and third-party manufacturers such as Sigma and Tamron. Check out our best deals on the D850 below.